If Japan wants to ensure it stays relevant on the international stage then it needs to better utilize its culture. Japan’s presence in the international community appears to be fading. Even during last year’s euro crisis, while China’s response drew much interest, there was almost no mention of Japan. This isn’t to say that Japan has completely disappeared from view. Despite its two “lost decades” and the grim circumstances surrounding last year’s earthquake and tsunami, no one doubts that Japan will recover. Japan’s standing as a stable, global and developed nation remains unchallenged. The problem is that Japan lacks self-awareness not only of its role as a global player, but also of its potential – not least in terms of cultural diplomacy. Yet utilizing this potential needs to be about more than creative content, which is after all just a form of commerce. And merely exporting creative content doesn’t necessarily equate to influence. Instead, Japan must look at the diplomatic options its culture offers, and there’s no arguably no better place to look to understand the potential than Europe, and specifically France. Long hailed as a cultural superpower, France has started to place renewed focus on cultural diplomacy. The French Institute, established at the beginning of last year as a dedicated cultural diplomacy organization, achieved its first big goal with a large symposium in Paris, held over two days in December. The theme of this symposium (which I attended as a panelist) was no less than cultural diplomacy itself. But what struck me were France’s efforts to reinforce a sense of urgency as it plays a strategic game of catch-up. The creation of the institute was the result of integrating the French Ministry of Culture’s Culture France, which had until then served as the hub of France’s cultural activities, with the external affairs and cultural activity sections of France’s Foreign Affairs Ministry. The Institute’s representative is Xavier Darcos, a conservative and highly-influential former cabinet minister who served as minister of national education until last year. The Institute also coordinates with Alliance Française (officially a private organization, but a French language learning organization with close ties to the government), which links 140 overseas cultural organizations and has 445 member schools around the world, bringing together some 5,000 artists, actors and cultural experts to organize as many as 50,000 cultural events around the world each year. The broad lineup of distinguished panelists included prominent literary critic and philosopher Julia Kristeva, whose works have even been translated into Japanese, as well as the president of the National Library and representatives of national organizations from various fields of the culture industry; French Minister of Culture and Communication Frédéric Mitterrand and Minister of Foreign Affairs Alain Juppé also attended to deliver speeches, while the symposium itself was broadcast live on the Internet. In a session on the content creation sector at the symposium, the president of major French publisher Hachette, as well as representatives from Unifrance (an organization that promotes French films abroad), Sotheby’s France and the National Video Game Association talked about their achievements overseas, prompting questions from the floor over how these types of cultural activities can be linked to diplomacy. And this is the core question, but one without a clear answer. Many note that cultural diplomacy doesn’t have an immediate impact, but at the same time, few would suggest that culture isn’t an essential element of international exchange and diplomacy. Still, while there’s uncertainty over the limits and potential of cultural diplomacy, the idea of public diplomacy has become increasingly popular. Essentially, public diplomacy is about trying to encourage the citizens of one country to form a favorable image of your own country by helping them better understand its culture. In a sense, it’s like propaganda, but rather than acting as PR for specific government policies, it’s broader and is seen as more relaxed. But back to Japan. In Japanese diplomacy, PR and cultural activities are typically under the same umbrella. I experienced diplomacy in the field when I worked as a public relations and cultural affairs minister of the Japanese Embassy in France during a two-year secondment. My department had integrated its public relations and cultural affairs work, and while this was partly a manpower issue, it also stemmed from the traditional view that culture had little independence in diplomacy. The way the Japanese Foreign Ministry works, PR activities are described as either policy-oriented or general public relations work. As the name suggests, policy-oriented public relations involves public relations specific diplomatic issues. This is the main part of public diplomacy. On the other hand, general public relations seeks to have the intended audience become familiar with Japanese history, culture, society or lifestyle. As this also includes aspects of educational and awareness-raising activities, the term “educational public relations” is also used. As a result, educational and cultural activities are positioned as an area of public relations. At the French Embassy in Tokyo, in contrast, the public relations and cultural affairs sections are independent of one another. Culture ranks high among diplomatic activities and is clearly defined. Japan hasn’t yet arrived at this way of thinking. Much of Japan’s traditional culture is derived from “Zen” culture, but while understanding of this culture deepens the more one learns, it lacks pomp or color. In contrast, in the increasingly popular area of Japanese pop culture, fun and diversity are key selling points. While it may be seen by many as inferior in terms of artistic quality, it has a simplicity that allows for the transmission of a strong message around the world. Indeed, Japan can’t afford to downplay the popularity of pop culture because it plays such a big role in broadening the base of understanding Japan. Last October, an annual manga, DVD and video games fair was held in the medieval town of Lucca, in Italy’s Tuscany region. As well as the usual stands filled with manga, anime and related goods, toys and fashion items for young people, the fair managed to recreate the atmosphere of a Japanese summer festival by including touches like selling fried noodles. Around the same time, the major manga festival known as Salon del Manga was held in Barcelona. Here, Japan enjoys an even greater presence. The festival was dominated by stands for Japanese manga comics such as NARUTO and ONE PIECE, and crowds of young people were dressed up as popular characters. The sight of junior high school students decked out as their favorite characters and sipping cup noodles in a corner of the venue almost made me forgot that this was a foreign country. That’s not all. Celebrating its 12th event last year, the Japan Expo, held in the suburbs of Paris, is Europe’s largest participation-based exhibition of Japanese pop culture. As many of 500 booths were set up at an event that included concerts, exhibitions and martial arts demonstrations. It attracted more than 190,000 visitors during its three-and-a-half day running period. 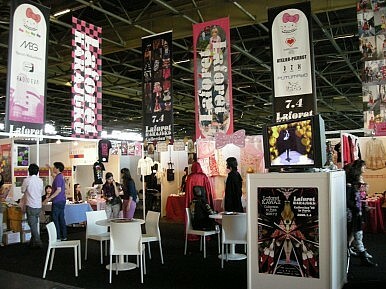 One of the reasons the Japan Expo has grown larger than similar events in other European countries is that manga and anime are particularly popular in France. At the same time, organizers run projects based on well thought-out concepts. The event is positioned as a “Festival of Japanese Culture and Entertainment,” and is organized as an opportunity to share experiences of a wide range of cultural activities. But it’s not just in Paris that Japanese pop culture is well-received. In the summer of 2010, Kyoto-Tokyo: from Samurai to Manga was held at the vast Grimaldi Forum in Monaco to celebrate the 10th anniversary of the venue. Monte Carlo is renowned as one of the world’s great luxury tourist destinations, so the exhibitions held around this time each year capture the wonder of the world’s wealthy both in quantitative and qualitative terms. The organizers’ vision was clear: to showcase the big picture of Japanese culture from traditional to contemporary, with items ranging from exhibits of Buddhist statues, folding screens, earthenware, kimono clothing and wood block prints on loan from national museums in Tokyo and Kyoto, the display of traditional armor and headpieces and restored images of Edo Castle to original drawings of Mizuki Shigeru, contemporary architecture, anime, manga and robots. This kind of exhibition has become the pattern for how Japan is introduced at events held around the world. While I was stationed at the Japanese Embassy in France, I was invited to an international goods fair held in Clermont-Ferrand. Japan was one of the countries invited to take part, and not only did it go so far as to recreate the grounds of a Shinto shrine, but an arched bridge and goods such as kimono and Japanese tea were also on display. One image incorporated into many Japanese culture-oriented projects is the diversity of Japanese culture, and pop culture like manga offers a good entry point for people interested in Japan. Yet while the Japanese sense of simplicity and refinement known as wabi-sabi represents part of Japan’s spiritual foundations, few see these as reflecting the daily realities of Japanese society as one of the world’s leading economies and an advanced technological nation. As a result, the image conveyed at these exhibitions is one of tradition and modernity neatly mixing. The concept of “Cool Japan,” which flourished in the days of the Junichiro Koizumi administration, was Japan’s cultural diplomacy strategy, and it targeted pop culture. The term was originally used by Douglas McGray when describing Japan’s cultural potential in his essay “Japan’s Gross National Cool,” published in 2002. It described how in contrast with a Japanese economy that had continued to decline since the collapse of the bubble economy, Japanese pop culture had begun to exert significant influence around the world. Chief among these is the argument that these aren’t real examples of Japanese culture. Certainly, compared with traditional culture, some might say there’s less artistic value or depth. And international fans of Japanese pop culture aren’t necessarily interested in the culture, history or society of Japan. Finally, some complain about the commercialization of culture. However, historically, many artistic endeavors have flourished through conflict with authority. And while anime doesn’t necessarily directly lead to a deep understanding of Japanese culture or history, it’s probably fair to say that many children raised around the world on Disney might feel at least a little sympathetic to America. But Japan’s efforts are about more than anime. Japanese cuisine has latched onto the health food boom in Europe and elsewhere. In Paris alone there are estimated to be more than 300 Japanese restaurants. Japanese restaurants were once thought to be a hangout only for Japanese, but today they are dominated by French patrons. And even at high-end stores, ramen noodle shops in the opera district draw long lines right up until closing. This isn’t the first time Japanese culture has been popular in France. In the latter half of the 19th century through to the 1920s, Europe – and France in particular – underwent a period known as Japonism, the discovery of the cultures of small countries from the “East” which had been considered cultural wastelands before the rise of Western European modernism. With art as the starting point, Japanese society and lifestyles attracted a great deal of interest in France. From the Paris Expo in 1867, interest in Japan grew, and by the time of the 1878 Paris Expo, Japan had earned an enthusiastic following. This was in part the product of diplomatic propaganda and efforts to sell goods on the part of the Meiji government. But this differs from the Japan boom we see today, which reflects the penetration of youth-centric pop culture and is spreading from the ground up. It’s also proof of Japan’s rising status in the world. However, Japan’s failure to recognize this means Japan has failed to create a proper diplomatic strategy. So what needs to change? I believe the KANSEI Value Creation Initiative implemented by the Ministry of Economy, Trade and Industry from 2008 to 2011 will prove useful. Under this initiative, JETRO (Japan External Trade Organization) activities formed the basis for Japan Design Exhibitions held in major overseas cities. In Paris, an exhibition was held in the grounds of the Louvre in Decorative Arts section of the national museum, and proved hugely popular. The items on display included Japanese lacquer, white porcelain soy sauce containers, earthenware teapots, Japanese-style lighting, folding fans, glasses, air purifiers and LCD televisions. In these everyday lifestyle products was beauty in design combined with functionality. This could rightly be referred to as a sort of functional beauty, reflecting the characteristics of traditional Japanese aesthetics as typified by folk craft. Every item on display was classified and arranged according to specific Japanese expressions. These included expressions such as kagerou (ephemerality), nishiki (fine clothes), tatasuzumai (appearance), kime (wood grain), mottai (superior airs), karoyaka (light, easy), motenashi (hospitality), musubi (union, knot), oru (to fold, bend), shitsuraeru (to arrange, install) shinaru (to warp, yield) and habuku (to curtail, economize). The concept descriptions and product designs were beautifully linked, and this made it possible to easily form an image of Japanese culture. In these, the Japanese take on the concepts of kindness, flexibility, harmony with nature, modesty and tranquility were clearly communicated. In fact, these concepts don’t just express traditional culture, and they are also reflected in manga. The popular manga NARUTO depicts the development of a young ninja. Within the story, things such as friendship and solidarity are communicated with a style that’s distinctly Japanese. This can be seen as a successful example of how universal truths have been blended into Japan’s spiritual climate. Japanese should be proud of the fact that their culture has diplomatic applications. To have hard power you need to have soft power. In other words, setting aside military strength, Japan is highly regarded as an economic superpower and leading high-tech nation. This represents trust being placed in Japan, and is also a thumbs up for the Japan brand. But Japan also needs organic integration of organizations and projects. There has been talk of integrating four agencies engaged in overseas operations (the Japan International Cooperation Agency or JICA; the Japan Foundation; the Japan External Trade Organization, or JETRO; and the Japan National Tourism Organization, or JNTO), but these need to be about integrating strategy, not just a cost-cutting measure. Indeed, before cutting costs, the government should consider whether systems are in place to allow these organizations to conduct their respective activities properly. Speaking from my own experience, out in the field, there’s already an extreme lack of both the human and budgetary resources needed to adequately implement cultural activities. The development of overseas networks for turning culture into diplomacy is particularly inadequate. We need to assign good people to the task at hand, and create organizations and allocate resources to allow Japan to fulfill its potential. If we decide simply to reorganize existing institutions, we should first advance discussion of how to create a robust administrative organization to foster the development of better expert officers. One breakthrough in these discussions has been the revamp and increase in regular events being held overseas. There’s undoubtedly pressure over budgets from the Foreign Affairs Ministry, but I believe that depending on how such campaigns are run, they can be cost effective. The majority of the 758 projects implemented in 2008 to celebrate the 150th anniversary of diplomatic relations between France and Japan were funded by the private sector. Efforts to sustain local interest in Japan by concentrating on running events at least once every few years is essential. Another aspect to this is trial and error in coordinating each ministry and agency through regular events. During my time stationed in the field as a manager at the Japanese Embassy I was constantly on the move, but this provided the opportunity to have contact and exchange information with local representatives. Rather than just engaging in a cycle of academic discussions within the Tokyo bureaucratic machine I could see diplomacy in action – and what was needed to make changes. Japan is a cultural superpower whose world-leading conventions, values and culture are held in high esteem around the globe. And as we communicate positive images of Japan – images of peace and stability – I believe we can raise Japan’s standing further. The health and improved status of Japan’s culture industry will lead to the reinvigoration of Japanese diplomacy. As long as Japan is a global player, this is also an obligation that its government must meet. I believe the time has come for the Japanese people to open their eyes to this reality before they miss the chance. Hirotaka Watanabe is a professor and director at the Institute of International Relations at the Tokyo University of Foreign Studies. He completed his doctoral studies in international relations at the Universite de Paris I Pantheon-Sorbonne and served as a minister at the Japanese Embassy in France. ASEAN members remain ambivalent about Tokyo’s political influence. With a stagnant economy and China’s shadow looming large, what can Japan do to regain the initiative?